Fibroblasts and myofibroblasts are believed to be the key effector cells in renal fibrogenesis responsible for the synthesis and deposition of extracellular matrix components. In an editorial written 15 yr ago, Gown claimed to have the mysteries of the fibroblast (partially) unmasked (1). Unfortunately, 15 yr later many mysteries of the fibroblast and myofibroblasts remain intact and we are only beginning to solve the riddle this cell poses. This manuscript summarizes current understanding of the origin, phenotypic heterogeneity, and function of renal (myo)fibroblasts. Renal interstitial fibrosis is considered the hallmark of progressive renal disease. In particular, many studies have determined that the extent of tubulointerstitial involvement correlates better with renal function deterioration than glomerular changes do, thus the extent of damaged tubulointerstitial area in any given renal biopsy has important implications for the renal prognosis of the patient (summarized in ). Tubulointerstitial fibrosis is characterized by the accumulation of extracellular matrix (ECM) components including collagen types I, III, and IV, as well as proteoglycans and fibronectin. Fibroblasts are considered the primary matrix-producing cells in the kidney and hence they are clinically relevant as principal mediators of renal fibrosis associated with progressive renal failure. Originally, resident interstitial fibroblasts were described as contractile cellular elements being the sole source of ECM (3). Today, interstitial fibroblasts can be best defined as the nonvascular, nonepithelial, noninflammatory cells of the interstitium (and of connective tissue in general), and they are its principal cellular component (4). Fibroblasts synthesize many of the constituents of the fibrillar ECM, such as fibronectin and types I, III, and V collagen (5,6), and they are also a major source of ECM-degrading proteases such as matrix metalloproteinases (MMP), underscoring their crucial role in maintaining an ECM homeostasis via regulation of ECM turnover (7,8). Fibroblasts are considered mesenchymal cells that display a spindle-shaped morphology (9). However, due to the relative lack of specific markers, it can be challenging to distinguish fibroblasts from other cells of mesenchymal origin, such as pericytes, vascular smooth muscle cells (VSMC), or mesenchymal stem cells in the kidney (Table 1), and thus renal fibroblasts have remained relatively poorly characterized in molecular terms. The term “myofibroblast” is used for fibroblasts that possess unique contractile properties (6). Myofibroblasts were originally identified as the cells being responsible for wound contraction (10). In the setting of renal fibrosis, myofibroblasts are considered to represent an activated fibroblast phenotype, which is mainly responsible for ECM deposition in tubulointerstitial fibrosis (11). Myofibroblasts are large cells with long processes resembling fibroblasts and VSMC (12). In addition, they are characterized by bundled microfilaments, a well-developed rough endoplasmatic reticulum, hemidesmosomes, and other intercellular attachments (11). In the absence of electron microscopy validation, myofibroblasts are commonly identified by their expression of α-smooth muscle actin (α-SMA) (6,13). Identification of myofibroblasts based on the expression of α-SMA can be challenging, however, because α-SMA is also expressed by other cells of mesenchymal lineage such as VSMC and pericytes (1,4) (Table 1). Traditionally, myofibroblasts in the kidney have been considered to represent an activated population of resident fibroblasts (14). However, recent studies questioned whether the increase in the number of α-SMA–positive cells is the result of residual proliferating smooth muscle cells, proliferation of the few fibroblasts constitutively expressing the protein, or by de novo expression of formerly nonexpressing cells. This issue is further complicated by the observation that in anti–glomerular basement membrane antibody-induced nephritis (15), as well as in periglomerular areas in a study by the same group (16), early expansion of α-SMA–positive myofibroblasts is observed in perivascular regions similar to what had been described Wiggins et al. (15), suggesting that shedding of VSMC and pericytes contributes to the population of α-SMA–positive cells in the fibrotic interstitium. Furthermore, at least for some fibroblasts, activation is not associated with de novo expression of α-SMA (17). Ru and colleagues described that even among so-called myofibroblasts a higher degree of variability and complexity due to different levels of α-SMA expression may exist (18). In summary, all these studies support the notion that fibroblasts from kidneys with interstitial fibrosis differ from fibroblasts in normal kidneys. De novo expression of α-SMA is not the only change during the transition from fibroblast to myofibroblast. In fact, the radical change in phenotype is often underappreciated (19). The differences between fibroblasts from normal or fibrotic kidneys extend to their proliferative activity and matrix synthesis capacity (20). Müller and Rodemann determined that the relative percentage of fibroblasts was much higher in primary cell cultures from kidneys with fibrosis compared with their normal counterparts (47 versus 7%) (21). This finding was confirmed in a study by our group on primary human cortical fibroblasts (22), indicating an increased proliferative activity of activated fibroblasts. Furthermore, Rodemann and colleagues demonstrated that fibroblasts from fibrotic kidneys displayed a higher mitogenic potential, a higher resistance to the mitogenic drug mitomycin C, and a three- to five-fold increase in the rate of collagen synthesis as determined by 3H-proline incorporation (23), suggesting that such an activated phenotype of fibroblasts observed in the cell culture experiments was representative of their behavior in vivo. However, the preservation of this activation state is relatively poorly understood in molecular terms. Various stimuli have been found to induce fibroblast activation (24). In general, fibroblasts respond to stimuli associated with tissue injury by acquiring an activated phenotype (Figure 1). For example, infiltration of inflammatory cells results in the activation and proliferation of resident fibroblasts. These resident fibroblasts become activated by stimulation with cytokines including TGF-β1 (25), PDGF (26), and fibroblast growth factor 2 (FGF-2) (20), among others. Additional activation mechanisms include direct cell–cell contact (leukocytes and macrophages), ECM–integrin interaction (mainly α1 and β1), as well as environmental stimuli such as hypoxia and hyperglycemia (11). Most authors concur that cortical fibroblasts can proliferate (20), although no fibroblast proliferation was observed in a recent report by Yamashita et al. (27). In the setting of tubulointerstitial fibrosis, renal fibroblasts maintain their activated phenotype, even after the initial insult no longer exists (28). How such an activated state is maintained is only incompletely understood. Several studies demonstrated that autocrine secretion of fibroblasts is involved in this process. For example, our research group demonstrated that autocrine secretion of FGF-2 contributes to maintenance of an activated phenotype (29). Several recent studies in the cancer field suggested that epigenetic changes in response to cell injury could causally underlie such imprinted activation (4,30). Whether such epigenetic changes are involved in fibroblast activation associated with tubulointerstitial fibrosis remains to be determined. Activation of resident fibroblasts by stimuli associated with tissue injury. There is still a question of how these activated fibroblasts are cleared during resolution of a fibrotic process. One potential pathway is apoptosis, as was shown for activated Ito cells in the liver (31). In addition, reversion to a quiescent phenotype may be a second possibility, but this remains to be proven. If this possibility exists, then there may be a point of no return, after which autonomous fibroblast proliferation cannot be stopped and fibrogenesis invariably progresses. This is again of clinical importance because it was recently shown that fibrotic processes are potentially reversible in the kidney (32) as well as in other organs such as the liver (33). Understanding of physiologic clearance of activated fibroblasts is particularly important to develop therapeutic strategies to inhibit the progression of tubulointerstitial fibrosis. While ablation of activated fibroblasts has been proven to be effective in the setting of fibroblast-specific protein 1 (FSP1)-tk transgenic mice, due to the lack of fibroblast-specific targets no such approach has been developed for potential therapy as yet. Most therapeutic approaches are thus designed to “normalize” activated fibroblasts, reverting them to their quiescent physiologic phenotype. In this regard, our group has successfully demonstrated that excessive matrix synthesis and proliferative activity could be inhibited by various molecules such as pentoxyfilline, IFN-γ, relaxin, or bone morphogenic protein-7 (BMP-7) (34–36). More understanding of fibroblast-specific biology is required to design more specific therapeutic agents. Due to the lack of systematic lineage tracing studies, the origin of fibroblasts is still controversial (4). As early as 1867, Cohnheim wrote a classic manuscript on chronic inflammation, in which he stated that fibroblasts (he called them contractile cellular elements at the time) are direct descendents of migrating leukocytes (3). However, over 100 years later, Ross et al. demonstrated, in a very elegant set of experiments using parabiotic rats, that fibroblasts are not derived from blood cells but were instead of local origin (37). Such thinking was corroborated by studies that demonstrated that adult fibroblasts localized to the sites of embryonic mesenchymal cells, suggesting that adult fibroblasts are direct derivatives of embryonic progenitor cells. For example, a study, which evaluated mesenchymal cells and fibroblasts in rat kidneys from E14 to E28 and postnatally until day 28 suggested that the interstitial kidney fibroblasts are derivatives from the uninduced mesenchyme (38). While molecular evidence for such thinking is lacking in the kidney, an elegant study that used retrovirus-mediated lineage analysis of the inner ear revealed that fibroblasts have a common mesenchymal progenitor (39), suggesting that adult resident fibroblasts arise locally during embryogenesis via division and differentiation of mesenchymal progenitor cells. However, recent studies point again to a possible bone marrow origin of at least some fibroblasts, and the concept of fibroblast stem cells has gained wide popularity, although its exact contribution remains to be determined (40). 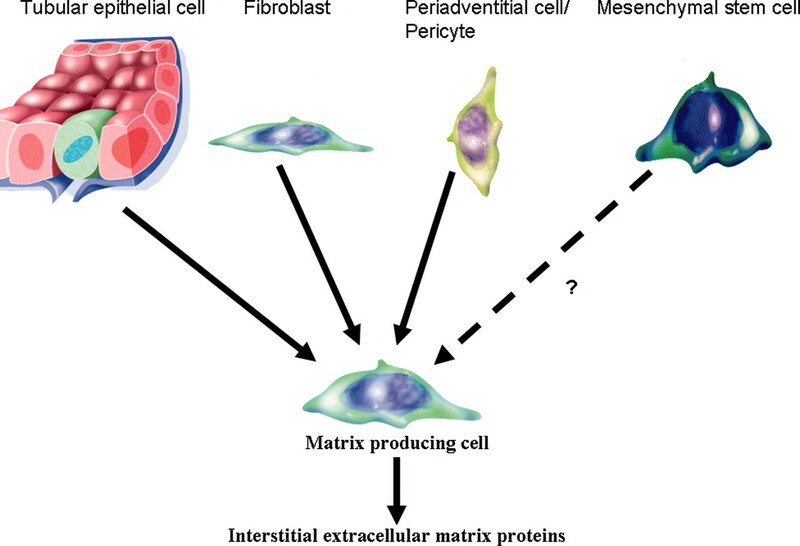 Moreover, periadventitial cells (15) and tubular epithelial cells (41) have been implicated as the origin of matrix-producing cells (Figure 2). In summary, evidence is evolving that the origin of kidney fibroblasts is as diverse as their phenotypic heterogeneity. Possible origin of matrix-producing cells in the kidney. 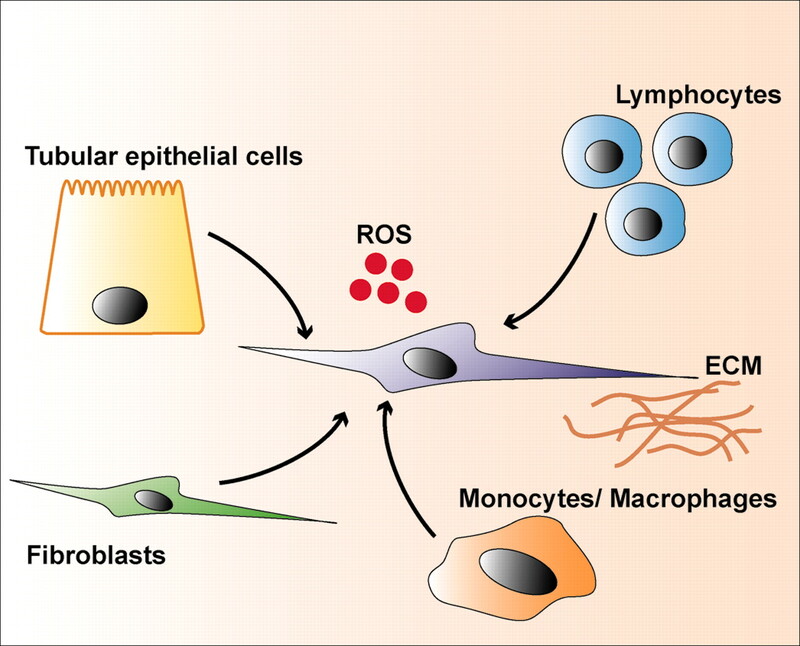 As opposed to fibroblasts being direct derivatives from resident embryonic mesenchymal cells, a number of recent studies have confirmed the existence of bone marrow–derived cells within the interstitium (42) and the mesenchymal–epithelial transition of bone marrow cells to tubular epithelium (43). Preliminary evidence using genetically tagged fibroblasts and tubular epithelial cells indicates that fibroblasts derived from bone marrow comprise about 12% of the resident interstitial population in normal murine kidneys (44). In that study, this percentage did not change when an experimental model of progressive renal disease was induced. Conversely, up to 36% of additional ECM-producing cells derived from tubular epithelial cells by epithelial–mesenchymal “transition” (EMT; see below). Moreover, in a study in human biopsies from patients with chronic allograft nephropathy, it was suggested that up to 30% of interstitial mesenchymal cells were of bone marrow origin (42). However, a recent and very elegant study by Roufosse and coworkers used a transgenic mouse expressing both luciferase as well as β-galactosidase reporter molecules under control of the promoter for the α2-chain of type I collagen (45). Using these mice as male bone marrow donors into female wildtype mice, a mean of 8.6% of α-SMA–positive cells within the tubulointerstitial space were identified by positivity for the Y chromosome after induction of unilateral ureteral obstruction (UUO) in recipients. The bone marrow–derived cells, however, were completely negative for luciferase, indicating a lack of collagen synthesis. In summary, with respect to the technical difficulties that come with the available reporter gene techniques, the origin of fibroblasts remains an unsolved question and further molecular studies are required to determine the contribution of bone marrow–derived cells to fibroblasts in the kidney. The term “EMT” is used preferentially to describe the conversion of terminally differentiated epithelia into cells with a mesenchymal phenotype (i.e., cells with a fibroblastoid appearance and positivity for mesenchymal cell markers) (44). EMT is a variant of transdifferentiation and a well recognized mechanism for dispersing cells in vertebrate embryos (46), forming fibroblasts in injured tissues (41,44), or initiating metastases in epithelial cancer (47). The conversion of epithelial cells to mesenchymal cells was first described in 1982 in a seminal study by Greenburg and Hay (48). Regarding renal fibrogenesis, EMT was first demonstrated by our group in a murine model of anti-tubular basement membrane disease by cloning of FSP1, a member of the S100 family (41). FSP1 expression is constitutive in tissue fibroblasts under physiologic conditions (41), and its promoter contains a cis-acting element (FTS-1) highly specific for fibroblasts (49). Although there has been some controversy regarding the exclusivity of FSP1 expression in fibroblasts (50,51), this specificity was demonstrated in an elegant experiment, in which cells expressing green fluorescent protein (GFP) under control of the FSP1 promoter were isolated from kidneys of FSP1-GFP transgenic mice and analyzed by FACS, demonstrating that the FSP1-GFP–positive cells are indeed exclusively fibroblasts (51). Furthermore, by placing the herpes virus thymidine kinase under the control of the FSP1 promoter in transgenic mice, and by the specific killing of fibroblasts via addition of nucleoside analogs, interstitial fibrosis is prevented, further indicating the specificity of FSP1-positive fibroblasts (52). Analyzing two mouse models of chronic progressive renal disease, FSP1 expression was robustly upregulated in the tubulointerstitium. The initial staining pattern was very similar to the distribution of collagen-producing cells in a rabbit model of anti-glomerular basement membrane disease with a perivascular accentuation (15). However, de novo expression of this fibroblast-specific protein could be detected in tubular epithelial cells in both models of chronic progressive renal disease, suggesting a possible transition of these cells to a mesenchymal phenotype (53). This phenomenon had been described in a number of organs, including the thyroid and mammary glands, as well as the retina (reviewed in ). EMT is a dynamic process that involves the gradual loss of epithelial cell markers associated with a gain of mesenchymal markers. This process is associated with various intermediate stages of cells that co-express epithelial cell markers as well as mesenchymal markers. To distinguish stress fiber–expressing epithelial cells from cells that are actively undergoing EMT, the loss of the epithelial adhesion molecules such as E-cadherin and ZO-1 paired with increased expression of mesenchymal markers such as vimentin, α-SMA, and/or FSP1, in addition to migratory activity, are used as criteria to detect EMT. However, absolute criteria have not been defined. Recently, Nishitani and colleagues described the use of the FSP1-antibody as a prognostic marker in patients with IgA nephropathy, indicating its potential usefulness even in human biopsies (54). Regarding the situation in the kidney, the occurrence of this phenomenon is not surprising. Because tubular epithelial cells (with the exception of collecting duct cells) are derivatives of the metanephric mesenchyme, they seem to be particularly well suited to undergo phenotypic changes toward a mesenchymal phenotype. Thus, this process can be described as a reiteration of renal developmental programs (55). De novo expression of FSP1 is not the only change observed in tubular epithelial cells undergoing EMT. Ng and coworkers described the de novo expression of the myofibroblast marker α-SMA in tubular epithelial cells starting at day 21 after 5/6 nephrectomy (56). Tubular epithelial cells lost their apical-basal polarity and seemed to migrate into the interstitium as demonstrated by electron microscopy. However, it is interesting to note that FSP1 and α-SMA seem to identify different fibroblast populations, since the coexpression of both molecules seem to be the exception rather than the rule (17). It is still unclear whether all tubular epithelial cells can potentially undergo EMT. Most commonly, proximal tubular but also distal tubular epithelial cells have been implicated in EMT. In a recent study, Yamashita and colleagues suggested that there is a distinct population of renal progenitor tubular cells that may undergo EMT (27). However, studies by our group and by others predominantly suggest that all tubular epithelial cells possess the capacity to undergo EMT. Is the Origin of the Renal Fibroblast Comparable in Different Models? Even considering the heterogeneity of fibroblasts in the kidney and the various markers that are commonly used to detect them, there is a remarkable variability in the results of recent studies that evaluated renal fibroblasts in kidney disease. A possible explanation for such discrepancy is that fibroblast recruitment occurs in a disease-specific manner. In this regard, Faulkner and colleagues analyzed the origin of α-SMA–positive cells in an accelerated model of angiotensin II–induced renal fibrosis after Habu venom injury. Faulkner et al. concluded that most if not all of the tubulointerstitial α-SMA–expressing cells were of local origin (57). There were no disruptions of tubular basement integrity, and no traffic of proximal tubular epithelial cells into the interstitial compartment was observed by labeling with Texas Red dextran (57). Similarly, EMT was not observed in a model of overload proteinuria (58). However, using α-SMA expression alone as a marker for matrix-producing cells may not sample all these cells, as was nicely demonstrated by Okada and coworkers in a model of murine polycystic kidney disease (17). Thus, the origin of matrix-producing cells may vary according to the model used, although we need more studies that apply transgenic techniques given the difficulties in identifying matrix-synthesizing cells by common immunohistochemistry techniques. Iwano and colleagues showed very convincingly the relative importance of EMT for the UUO model (44). Moreover, the specific significance of EMT for the progression of renal disease was shown very convincingly by Yang et al., who demonstrated that EMT was critical for the progression of renal disease in the UUO model compared with the tissue plasminogen activator–deficient mice (59). The relative contribution of EMT to interstitial matrix deposition may also have therapeutic implications. Bone morphogenetic protein (BMP)-7 is a morphogen that was recently shown to be capable of halting and reverting renal fibrosis in experimental animal models (35,60,61). One of the main effects of BMP-7 is the inhibition of EMT (61). Additional therapeutic agents, such hepatocyte growth factor, which may halt progression in experimental models, also act at least in part by inhibition of EMT (62). In summary, the mysteries of the renal fibroblast are difficult to unmask and many aspects of these cells remain unsolved. The relative lack of reliable marker proteins, particularly for human cortical fibroblasts, may be an indication of the heterogeneity of this cell type. Conversely, myofibroblasts can be easily detected in vivo via expression of α-SMA, but it is probably only one of many activation states of fibroblasts if we define these cells as interstitial matrix-producing cells. Matrix-synthesizing cells may be derived from resident interstitial cells, mesenchymal and/or hematopoietic stem cells, periadventitial cells, and/or by the process of epithelial mesenchymal transition. The renal community has learned in recent years that the relative contribution of these various cellular elements may vary according to the model of progressive renal disease studied. From a clinical point of view, it is interesting that this contribution may have therapeutic implications. Research into fibroblasts and their origin will be an exciting area in which to work in the years to come.